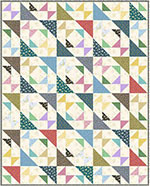 The concept behind our virtual shop hop is exactly the same as taking a fabric shopping trip by car. 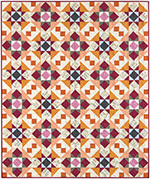 On our "virtual" shop hop, however, you'll leave the car in the garage and can even shop in your jammies! 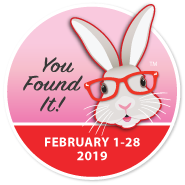 You will have a month to get around to over 100 of the sites to find the "YouFoundIt" Bunnies to qualify to win prizes. There are 12 hops scheduled for 2019. 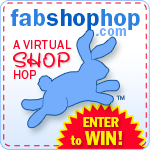 To join the hop, go to the FabShop Hop website to register. Once you are on the Registration page, scroll down to the registration form. 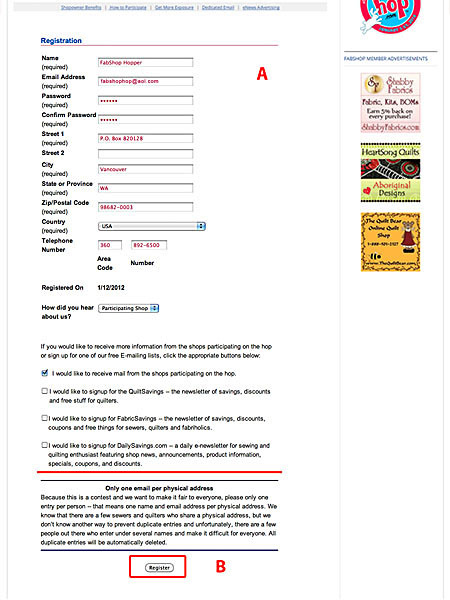 Fill out the form completely, select an option from the drop-down menu, and choose any of the options to receive mailings. 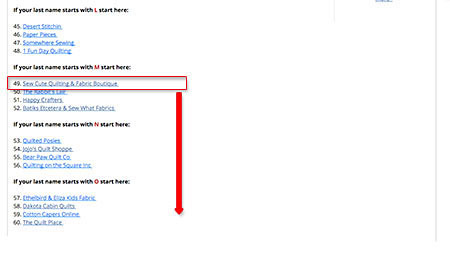 When you are finished with the registration information, select the Register button. 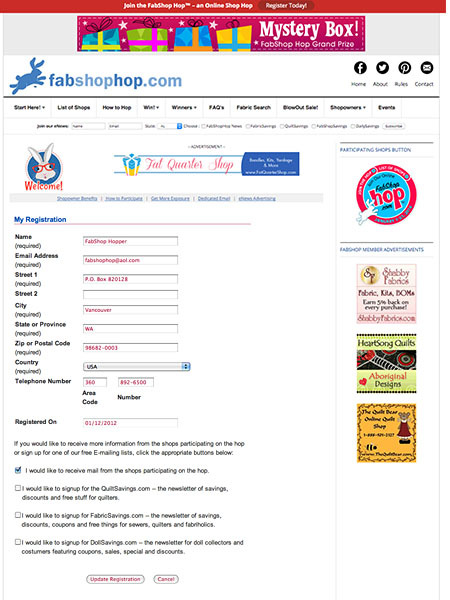 After you have selected the Register button, you will receive a confirmation email. 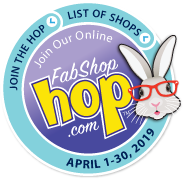 Note: Once you have submitted your registration and participated in one FabShop Hop, you will not need to register again for future FabShop Hops. 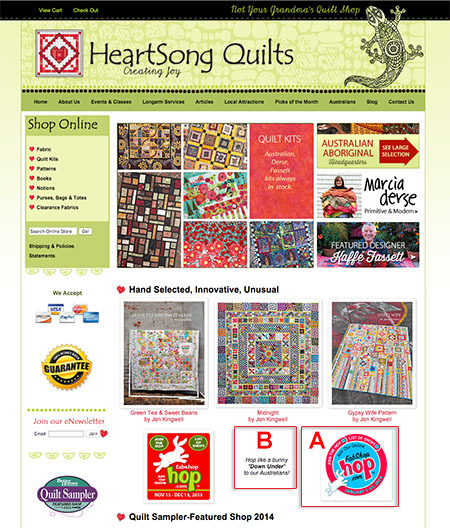 By visiting the sites during the Hop month, you'll have an opportunity to explore your "soon to be favorite" fabric/quilt shops and design studios as you qualify for random prize drawings. 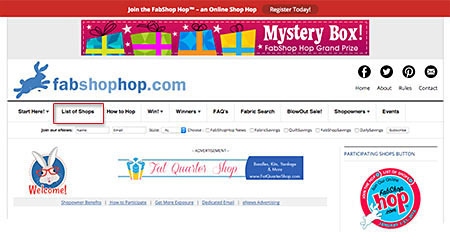 To begin, Select the FabShop Hops tab from the top menu, then select the List of Shops from the dropdown menu. 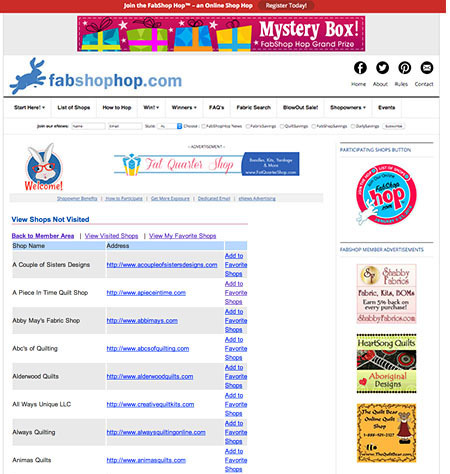 On the List of Shops page, you will find a list of all the sites participating in this month's FabShop Hop. Scroll down to the list. Select the the first letter of your last name to jump to your starting point. Once you've selected the link to the first letter of your last name, select the first shop link. Watch for the colored balloons next to shop names. 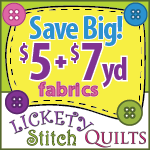 This means that shop is offering a special that week for FabShop Hoppers. Check back each week and look for other colored balloons indicating a new shop special for that week. 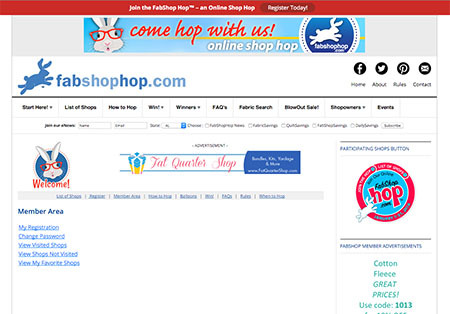 Participating websites will display the Bunny logo for the current Hop on their home page. Each Hop will have a different color background along with the dates of the Hop. 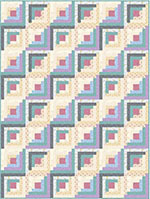 You can find a list of this year's planned Hops on the When To Hop page under the FabShop Hops tab. 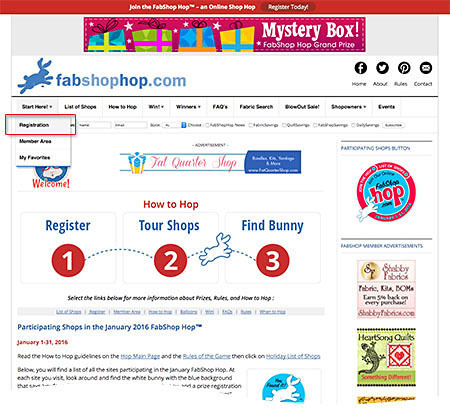 You can view the current Hop's Bunny logo and YouFoundIt bunny on FabShop Hop's home page. After selecting the first link at your starting point of the List of Shops, you will be directed to the participating website. 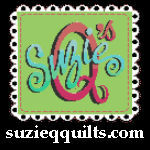 Look for the current Bunny Logo (A). 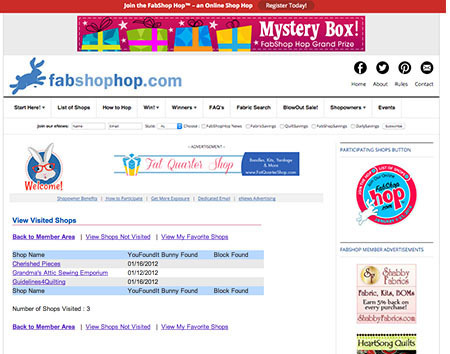 Many participating shops will leave a hint as to where to find the hidden "YouFoundIt" bunny. Begin looking through the website to find the "YouFoundIt" bunny. Once you find the "YouFoundIt" bunny, click on it. This will take you to the Prize Verification page. On the Prize Verification page, you will find instructions for registering the "YouFoundIt" bunny that brought you to this page. 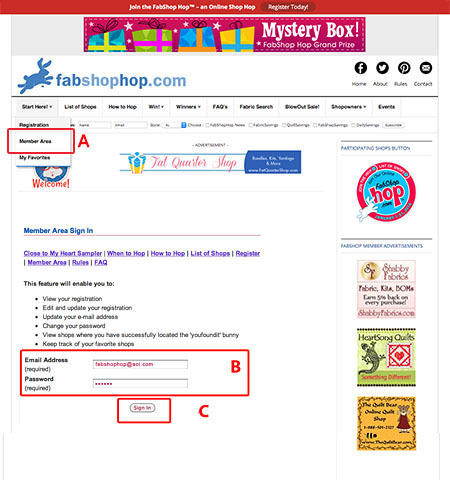 This is how you become eligible for random prize drawings and how we know you visited this website today. Enter the email address you used to register to participate in the hop. 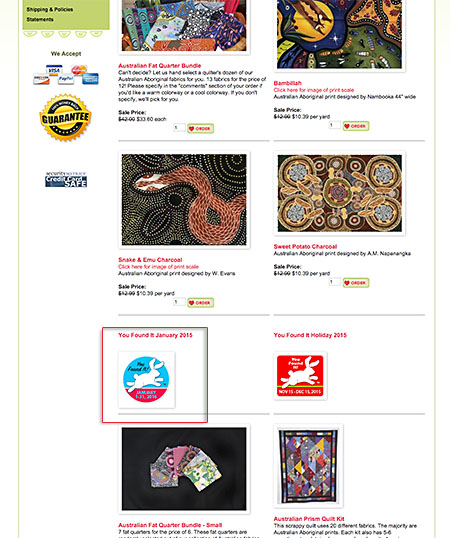 Select the Register for Prizes button. This sends a message to our database that you registered for prizes and in what website. 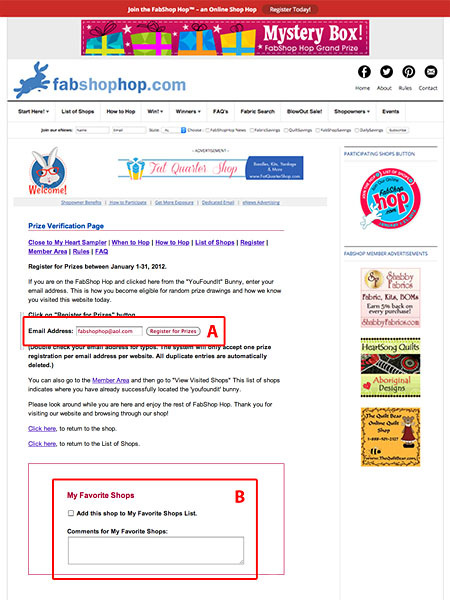 If you like the shop you just visited and want to bookmark it to come back to later, scroll down to the "My Favorite Shops" section, check the box, add a reminder to yourself, and go back up to the Register for Prizes button and click again. 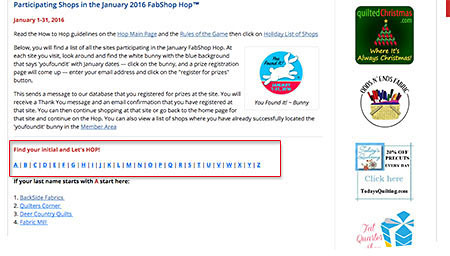 You will receive an email confirmation that you found the bunny and the name of the shop. 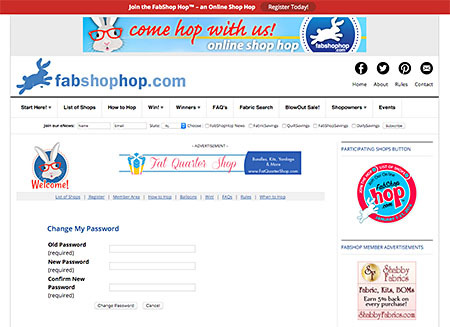 The Member Area features enable you to view your registration, edit and update your registration, update your e-mail address, change your password, view shops where you have successfully located the 'youfoundit' bunny, and keep track of your favorite shops. Select the Member Area tab under Start Here in top menu. Enter the User Name and Password that you chose while registering. You will be taken to the Member Area where you can choose from several links to manage your hopping experience. 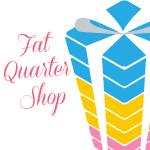 Shows a complete list of shops you have not yet visited, links to the shops, and ability to add them to your list of Favorite Shops. 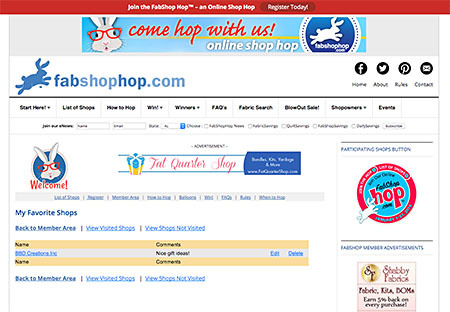 As one of your favorite shops, allows you to edit your comments, and delete shops from your list. 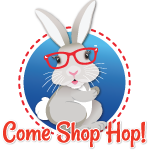 ( Ways to Win Hop months only) As you are touring the shops, bonus bunnies will be be showing up randomly from shop to shop. When you register for prizes, the prize verification page will let you know if you've found a bonus bunny. 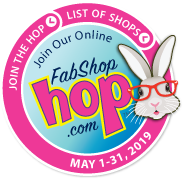 Find all participating shops youfoundit bunnies, plus 10 bonus bunnies to be entered into an additional random prize drawing! You can search for bonus bunnies even if you have already found youfoundit bunnies for this hop – just visit the shops again. You can find bonus bunnies all month long!